Since the flows on the Westfield river went up (again), I decided to travel north instead. Since I got a fairly late start, I decided to fish the Newfound since that was closer than any of the white mountains streams. This river is fairly short but is renowned for its fly fishing only area that supposedly fishes well through the spring, fall, and even winter months. It does not receive a fall stocking so late season fishing is supplied by lake drawdowns which may or may not add large bows, salmon, and lake trout into the mix. It apparently also gets hit hard, hence why I haven't made a real effort to get out that way. Since I had heard good things, I decided to chance it and give it a try instead of fishing more reliable local spots (wanting a little more of a challenge). When I got there, it was getting cloudier and it started to drizzle while I was setting up. The weather report first indicated overcast weather so I was feeling a little nervous since the river was already quite high. Having driven far enough already, I decided to fish it. As I was eyeing a likely spot, I saw a couple fly fishermen come in and take it. Bummer, but it wasn't the end of the world so I worked downstream. The first thing that struck me was the clarity of the water. Even though the water was high, I could practically count the number of pebbles on the bottom of some runs. In the first couple of runs I fished, I wasn't able to see any fish nor register any bites in the faster, broken water, which started to worry me a little. I was straight up panicking when I didn't register any bites in a larger pool. In hindsight, it seemed better fished with a weighted streamer on sink tip or sinking line, since the best water was fairly inaccessible. To make matters worse, I went over my waders trying to cross the tailout so my trip was really off to a spectacular start. At this time, the rain started to pick up so I was wet, cold, miserable and fish less. Nevertheless, I decided to continue upstream in the hopes of picking up a fish or two before reaching my car. In the next run, I actually spotted a fish! 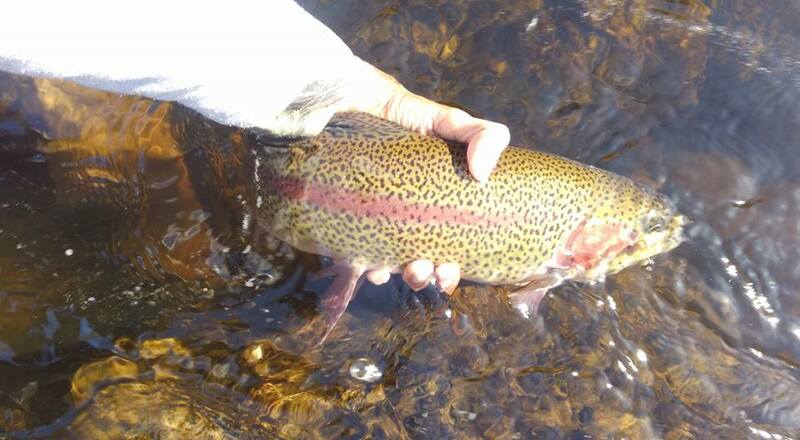 A nice rainbow that went for... my indicator. Unfortunately, there was so much overhanging brush that it was almost impossible to roll cast or even effectively mend line so I left and worked upstream. The next run was a nice bend where multiple currents met and created multiple seams, effectively making it a nymph fisherman's paradise! I worked the seams thoroughly, and bam! The indicator dove down and I was hooked into a nice bow. It ran and bulldogged its way to a terrific fight but oddly enough, no jumps! I snapped a photo thinking I wouldn't land it but ended up getting it to hand, only to have it muscle its way out of my hand and make off with my hot fly (BH hare's ear soft hackle). It was between 12-14". After working that run for some more time, I decided to get back to my car and drive to another spot. I drove downstream to the lower end of the fly fishing only area, where I ran into a couple other anglers. By this point, the river had swollen up even more because of the rain (mountain streams tend to swell up fast) and it made maintaining a drag free drift very difficult. That, and the rain were stifling me at this point because I was soaked through my clothes, skin, and bones. I ran back to my car, tied on a streamer that I picked up and tried a few casts but gave up when I wasn't able to get a deep enough swing (I feel it was more of a sinking line game at this point). When I got back to Nashua, I saw no evidence of rain! I might have been better off sticking local but at the same time, I was glad I took a risk and succeeded even though it wasn't a great day by any means. Overall, I liked what I saw with the Newfound river. The state certainly puts in some nice fish and there is always a possibility of getting larger drop down fish due to the rain so it has potential. I might have just picked the wrong day to fish since the river was still very high and got even higher with the rain today. Now that I know the river better, a follow up trip may even be more productive. Does anyone have any input on this river or been out lately?